A strong earthquake with a magnitude of 6.5 shook Mati City in the Province of Davao Oriental at 6:53 a.m. on Saturday, September 24, 2016. According to the Philippine Institute of Volcanology and Seismology (PHIVOLCS), the quake's location was 41 kilometers South and 40 degrees East of Mati City. Felt by most people indoors and outdoors. A strong shaking and rocking is felt throughout building. Small, light, and unstable objects may fall or overturn. Liquids spill from filled open containers. Leaves and twigs of trees shake. Intensity III - Tupi, South Cotabato; Cagayan De Oro City. The United States Geological Survey (USGS) downgraded the quake at magnitude 6.3 and said the epicenter was 36 kilometers South East of Tamisan. Tamisan is a coastal Barangay in Mati City. 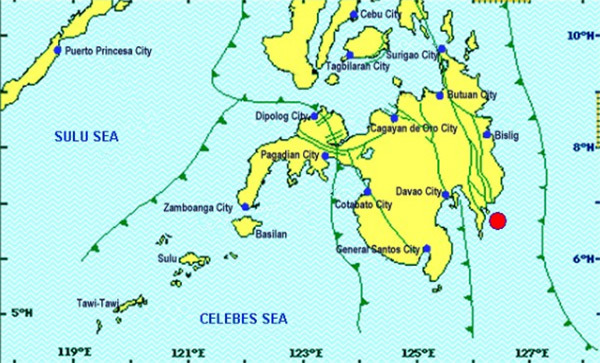 Tectonic in origin, the quake has a depth of 62.5 kilometers, the USGS reported. Aftershocks were felt, but no tsunami warning has been issued so far. There were no reports of injuries or damage to properties as of this posting.